We stock an extensive range of plaster mouldings, plaster coving, cornice and dado rails in addition to plaster ceiling roses.All in stock with fast delivery. 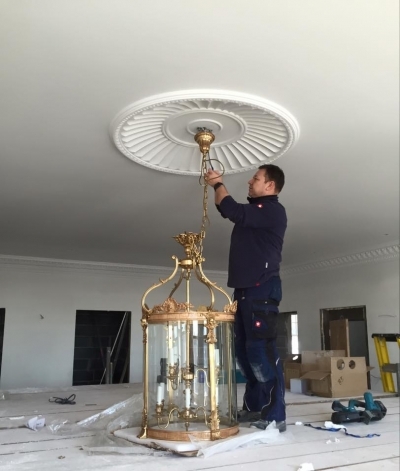 All our ceiling roses are all hand made and in stock, we have period plaster ceiling roses such as Victorian Plaster Ceiling Roses and Georgian Plaster Ceiling Roses. we have more modern ceiling roses available and art deco ceiling roses so there's something for every everyone in every type of home. We also have over 1000s meters of each one of our coving designs with vans going all over the country and to London three times a week. We stock Regency Coving, Swan Neck Coving, Victorian Plaster Coving, Georgian Coving and some more modern cornice along with many more all in a variety of sizes.